Book Boffin is a Production House that fills the gap between traditional publishing and self-publishing, the strategy and implementation team behind self-published creatives and providing the backend mechanisms to bring your book to market. Book Boffin serves author entrepreneurs by providing publishing education on both the principles and the pitfalls; we help build your unique blueprint for publishing to enable you to have control over your own book’s success. … Because you can’t do it all (nor should you want to) – so just do what works for you. We live in a world that provides ample opportunity for distraction. And as in life, the same goes for any project we undertake. According to Richard Koch, in his book The 80/20 Way, the 80/20 principle is not a theory but simply an observation of reality. “Unlike a spiritual or philosophical law, the 80/20 principle works whether you believe in it or not” – so I find it useful to keep in mind at the many decision points you may find yourself at when self-publishing a book. When you started your business you would have, no doubt, brought some amazing skill-sets with you. You may have started your business off the back of your design talent, inspired writing, your artistic genius – it’s often those talents that motivated you to step out into your own entrepreneurial pursuits – in order to do more of what you love. And then maybe, as you progress through your business journey there is a time when other skills need to be brought in to complement your own, to keep the business growing and to keep up with best practice in your industry. And it is this point that brings a choice, HOW do I want to bring this skill into the business? Do I skill myself up in this area, or do I pay someone to do this skill for me? It’s going to cost you time and money no matter what decision you go with – so make sure you are making the most efficient, leveraged decision for the business. There are so many things we could be doing, but how do we know what we should be doing? By doing absolutely everything yourself (that is, content creator, editor, typesetter, designer, marketer, project manager, web developer, salesperson, bookkeeper), you can sometimes fall into the trap of thinking you are being smart and saving money by not needing to hire in external help. The problem with this is that all your projects often move extremely slow, and that may translate to a slow return on the project’s investment because you have too many things going on and not enough time to do it in – and especially if this book is an extra project you are fitting into your already busy day. So the 80/20 principle can be a useful to dial into because 20 percent of the things you can choose to do in a venture will get you 80 percent of your results. And if you defer these choice points and just continue to do everything yourself, you will probably spend a heap of time doing the 80 percent of the activities that will net you only 20 percent of the results you COULD be getting on this project. Is it worth doing by ME? If not me, then whom will it be? Because some activities may get you a result, and are worth you doing. However, some activities may get you a result, just not if it’s done by YOU. For example, just say you have written your draft and you think it could probably do with some editing. So, is it worth having your book edited? Absolutely. Books with poor grammar and riddled with typos prompt bad reviews by readers on the online retailers, which has a negative impact on sales. In contrast, a properly edited book helps the book flow, so it is more easily read, which means it is more likely to be read all the way through, which will increase it’s chances of getting a good review, which in turn helps sell more books to others who are encouraged by the positive effect it has had on someone (after all, social proof is a powerful motivator). So, should it be edited? For you, that may be a resounding YES. Should it be done by me? The answer to this is: probably not. If you have toiled over your 50,000-100,000 words – writing, reading, re-writing, re-reading… your eye will start to forgive small grammatical errors or typos as you read it over and over. You just won’t see them, no matter how detailed a person you are. So it is always good to get another set of eyes on it – even if it is just for a final proofread – or perhaps a bit of editing if writing a book is a bit different to your normal writing style (say, if you are normally delivering your written content through blogging, or writing course manuals for trainings). Are you creating lots of busy work for yourself or are you taking action towards your outcome? It’s all about Action versus Motion. And that will depend upon the task at hand. By learning to work with a team and be more strategic, your results for each project will improve. You will be taking the right action, rather than creating a lot of motion. And that is when you become not only time efficient, but also time effective. Time effectiveness is crucial for not only getting your book published according to your set deadlines, but also once your book is published and you are then looking to optimise. You may find that approximately 80% of your revenue will stem from 20% of all sources. In other words, 20% of your sales channels will lead to 80% of all book sales. Finding those profitable channels quickly and optimising that opportunity will gain you valuable momentum. This is why it is useful to bear this principle in mind and ruthlessly look at the data, look at the activities you have to undertake every day to maintain this asset (your book), and through this lens determine which ones are actively serving your business and which ones aren’t generating results. The more attention you pay to the 80/20 principle, the more you’ll see it play out. Over the years, I have been to ALOT of book launches… so have gathered a few tips here on what I have seen work well and what seems to gather a collective eye-roll when the author is not looking. Give as much notice as you can. Between 2 and 6 weeks depending upon how far some people are prepared to come. 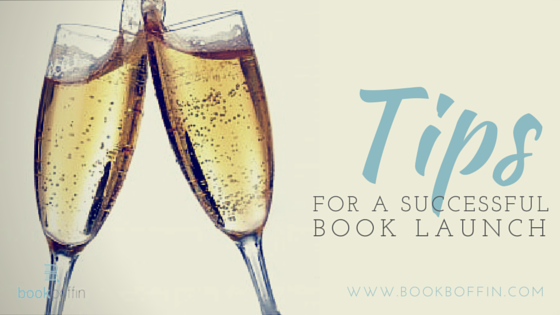 Don’t be limited in thinking of suitable venues for your book’s launch – the venue does not have to be book-ish. Think creatively about what would work well with your book’s message or theme. Secure a keynote speaker who is known and admired in your industry, and also speaks well. They don’t have to be someone who speaks for a living, or famous, or a celebrity – just someone who has achieved in your area/industry/sport/niche, has the respect of peers and is likely to perform the duty of being an entertaining host of the party. If they are known, make sure you include their name on the launch invitations. Apart from securing a venue, securing the speaker would be important to confirm as early as possible – for two reasons. Firstly, they may require many week’s notice if they have a busy schedule. And secondly, securing a high profile speaker makes organising the rest of the details SOOO much easier (because if people know this person is going to be there, they are more likely to come). Invite as many supportive people you know Send a reminder email the day before (and a post on Facebook if appropriate) because people get busy and they forget. Invite as many industry influencers you know (and follow up with these people to make sure they RSVP). People coming along love to hear from the author, in relation to their book. This can be deeply uncomfortable for some people – but it truly makes the night if your supporters hear a few heartfelt words about what inspired the book. A couple of minutes is all that is needed and can include a short reading from the book, as long as the passage matches the mood you are trying to set for the evening. This is particularly important for weekday evening launches, as many people come straight from work. If your budget stretches further, a tab at the bar also goes down well, but not necessary. Have a bunch of books there for people to buy and have someone in charge of selling them – as long as it’s not you. That is not your roll for the night because you will be busy basking in the celebration of having your book launched! If your launch is in a bookstore (or hosted by a bookstore), they usually take care of the sales for you, and retain a percentage of the sales. Make sure you have a felt tip pen or sharpie on hand to sign books – people come to book launches just so they can have their copy signed by the author. This is not an exhaustive list, however if you have given some consideration to the above 7 items you are well on your way to a successful book launch. Time to pop the champers! Should you make your book permafree? If you have published more than one eBook and are aiming to increase your following of readers, you may be considering heavily discounting one of your books in order to entice readers into making a ‘no-brainer’ purchase decision – with the goal of gaining some of those dollars back (a repeat reader) when they go on to buy your subsequent books. Many authors have won new reader’s hearts with their low price or zero price initial book offering, and it is a strategy that works particularly well if you have a series of books to funnel your readers through. If you sell your ebooks through Amazon KDP, you will know the minimum price you can set your eBook to is 99 cents, because setting your book to free does not make Amazon any money. However, there are eBook titles that are always available on Amazon for free (that is, they are not participating in the KDP select program where they are able to set their books to free for 5 days in every 90 day cycle) – so how do you make a Kindle book permanently free? Setting your Kindle book to free, permanently. Part of Amazon’s Terms and Conditions require you to not sell your eBook for anywhere online for less than the price you have set it to on Amazon. If you do not comply with the Amazon terms, they will automatically price match your book to the lower price. Authors use this policy to their advantage when setting their book to permanently free (or ‘permafree’). Simply set your eBook to 99 cents in KDP, then set it to free on another eBook platform (Smashwords allows you to set your book to free). Rather than waiting for Amazon’s bots to catch up with you, you can email Amazon Customer Service and alert them that this title is free elsewhere and provide them with the link. As per their own policy, they are obliged to set the same title to free on the Amazon store. Note: use this tactic if you are confident you want this title permanently free, it is not recommended if you are experimenting with different price points as the Amazon wheels can sometimes turn slowly if you are wishing start charging for this title in the future.